coin collectors group. The coin was a common date Indian Head cent. I guessed AU-58, but I was the only person to think so. One guess was as high as MS-65! The coin turned out to be AU-58 but "Details" because of recoloring. I didn't like the color, but didn't say anything because digital photographs can be very subjective with regard to that. As I said after the grade had been revealed, "No, the grading is accurate. The recoloring is hard to pick up from a photo as variations in lighting can change that radically. ANACS saw it in hand." Someone commented that they didn't like ANACS grading, but in fact the coin was almost a perfect match for the AU-58 photo at PCGS Photograde! Take a look at these photos on the right. These are all the very same coin, photographed under different conditions of lighting. Two are straight from my iPhone and two had some additional adjustments with iPhoto. If I posted these at different times and asked people for grading opinions, they'd each attract different answers, and probably some comments about color too. My bet would be that the last one down would be seen as the highest, but of course that's nonsense: they are all the same coin. None of the photos look like the coin actually does "in hand". 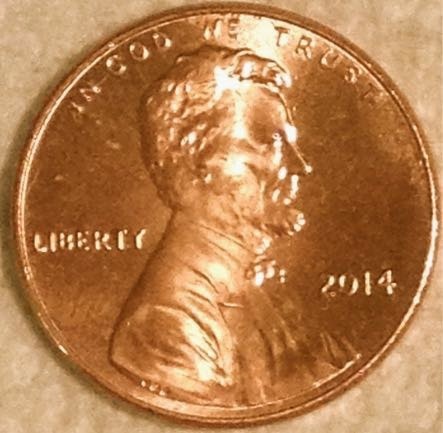 Whenever I see one of those "Guess the Grade" or "Has this coin been cleaned" posts, I keep this in mind: photos lie, and photos by unprofessional photographers are almost certainly not representing true color. Photos can hide things. I have a proof Eisenhower Dollar that photographs beautifully, but in hand there are obvious "milk spots" in the fields. A 1955 Franklin have shows rather unattractive toning in a photo, but in natural light it looks quite good. You should keep all that in mind when buying coins over the Internet. Photos at high end auction houses are likely to be good representations, but photos by eBay sellers may not be and may even be artificially doctored to be deceptive. Don't be fooled by color in photos. It's not necessarily right.